Coming up soon we are going on our first vacation since getting the parakeets. It’s a cruise, and neither of us has been on one before. Usually at this point pre-vacation I would be bouncing off the walls with excitement and pretty much packed already but I am dragging my feet because I’m sad and nervous about leaving the “babies” behind. 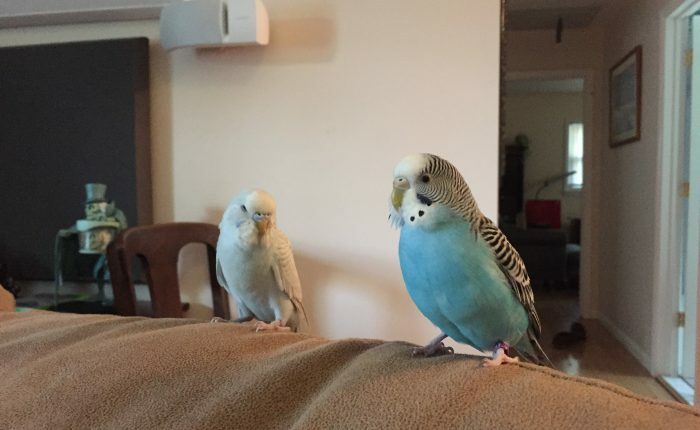 I’ve seen a few alarming Yahoo questions where people ask things like “I’m going away for a week, can I just leave my parakeet extra food?” and thankfully responders always tell them that is a horrible idea. Not only could the parakeet somehow ruin his water/food and die waiting for you to come back, but how sad would that be for the poor parakeet(s) sitting alone waiting for you to come home? We’re very lucky that my mom can come by every day and refresh their water bowl (even though they also have their Lixit Bird Waterer – 5 oz ) and food and she even feels comfortable letting them out of their cage and hanging out until they are ready to go home, so they won’t miss out on too much free time. She absolutely loves animals and has a natural ability to get along with them, which is a major bonus for us! If my mom wasn’t available, or we were traveling together, I would hire a professional pet sitter with avian experience to come very day. I have a line on someone already and we’re doing a consult this fall, I definitely want to have a back up plan in place. One of the things we have done while away on overnight trips is set up lights on vacation timers, I don’t like the idea of plunging the birds randomly into darkness, even though we do have a bunch of night lights, but in winter I don’t think they would appreciate going to sleep at 4:45pm when the sun goes down. Going away in summer I’ll just leave the curtains open and let them keep a natural day cycle. If left to their own devices they will usually put themselves to bed around 6:30 – 7pm. I also laid in a supply of new toys and we plan to make some big switches a couple of days before we go so they have new stuff to play with and an updated layout to think about. I wouldn’t recommend waiting until right before you leave to make changes, you never can tell what toy or perch will randomly terrify a parakeet. Also, I don’t trust them not to hurt themselves on some things, and I like to monitor their interactions with new toys. That might sound over the top, but if you start reading reviews of parrot toys it seems like almost every product on the market has caused a bird to hurt itself. So, they’ll have adequate light and some awesome new toys to occupy themselves, and my mom coming every day to take care of food and water and for some play time. There’s nothing for me to worry about at all right? Then I guess I’m just worried about me! When I was first looking into getting parakeets I read somewhere “how do people with birds go on vacation”, and the half-joking answer was “they don’t” And while I’ve been pretty devoted to 1 or 2 getaways per year in addition to traveling for work, I wonder if those times are coming to an end for a while. On the other hand, I know getting away and disconnecting can be very important, and I don’t want to discount how much that matters to both me and my husband. I’ll update after we’ve actually gone on the trip and then I should have a much better idea of where my head is at. 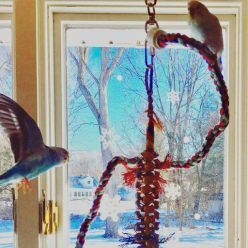 In the interim, I know we’re covering all the angles and the parakeets will probably have a great vacation from us!